Burger King, home of the Whopper, has joined a growing list of U.S. companies that have roasted President Donald Trump via social media. After Trump offered up a fast-food feast to Clemson University's championship football team at the White House, the president bragged on Twitter about ordering more than 1,000 "hamberders" -- a spelling mistake quickly corrected. Burger King's official Twitter account responded on Tuesday with: "Due to a large order placed yesterday, we're all out of hamberders. Just serving hamburgers today." 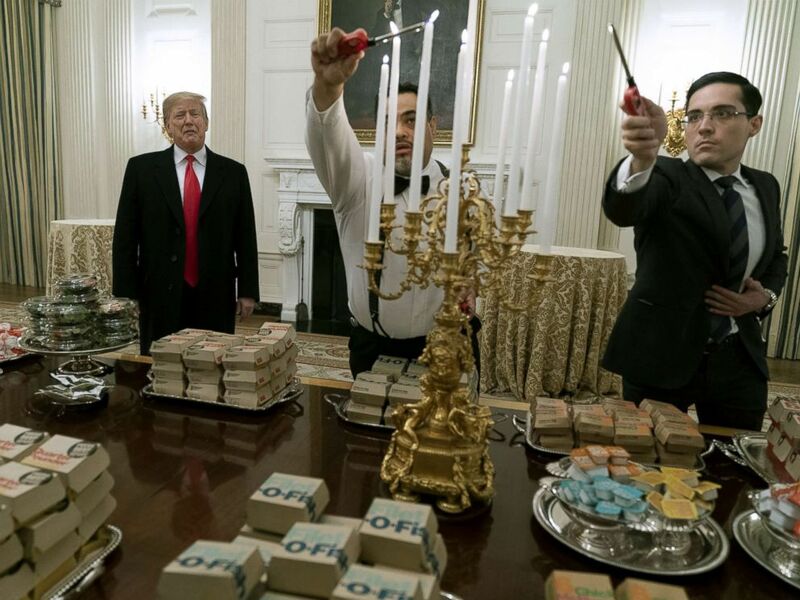 President Donald Trump presents fast food to be served to the Clemson Tigers in celebration of their national championship at the White House, Jan. 14, 2019. Burger King said it "has a pulse on pop culture" and told the Associated Press in a statement: "We like to playfully joke around with what the internet and news outlets are saying, but never to be mean spirited." Columbia Sportswear last week on Twitter relayed a message from CEO Tim Boyle that included the phrase "Make America's parks open again," riffing on Trump's campaign slogan. In 2017, as noted by the Associated Press, Smirnoff vodka erected billboards that read: "Made in America. But we'd be happy to talk about our ties to Russia under oath." Trump paid for the "massive amounts of Fast Food" because the White House chefs have been furloughed as part of the longest government shutdown in U.S. history.